Who needs a large SUV? Certainly not Philip Young nor Paul Brace. 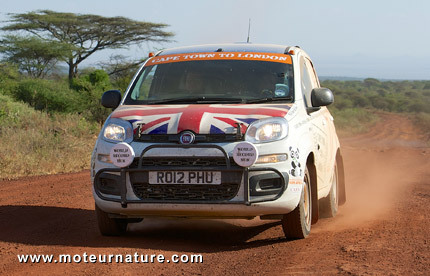 When many people think it takes a big and heavy 4WD vehicle to venture off-road, those two British gentlemen drove from Cape Town, in South Africa, to London, in a little Fiat Panda powered by a smallish .9-liter two-cylinder TwinAir engine. They drove through South Africa, Botswana, Zambia, Tanzania, Kenya, Sudan, Egypt, Libya, before Tunisia where they took a boat to Italy. And their trip wasn’t over yet. They still have to drive through Italy and France, cross the Channel, before joining London. Now, the incredible part of the story: they did it in 10 days, 13 hours and 28 minutes. There’s more on their 10,300 miles journey on their website, and besides the fact that it was a human challenge, because the two men drove and slept in turns (they had a short mattress in the back) in turns, the most impressive was probably efficiency. 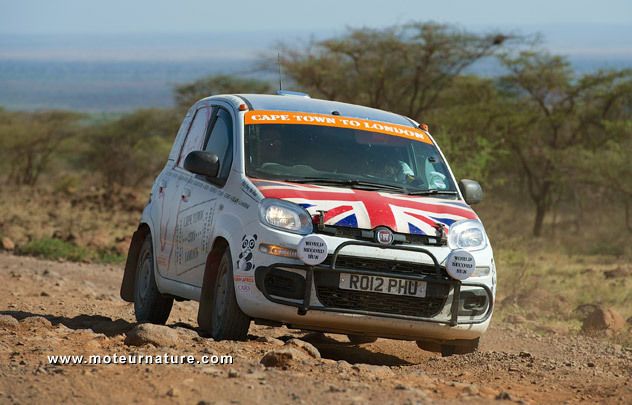 Why do people buy large vehicles like Range Rovers or Toyota Land Cruisers if a little Fiat Panda can do the same job, consuming far less energy? It’s now clearly proven that the answers are comfort, luxury, status, not off-road or long distance travel abilities.